Athens, Georgia – A retail food Chain has received a lot of attention since a customer posted on Saturday a picture of a large bathroom sign that reads unisex. But the decision of having a gender-neutral bathroom is not the only reason why everybody is talking about it, the explanations why the food chain has it have caught a lot of attention too. 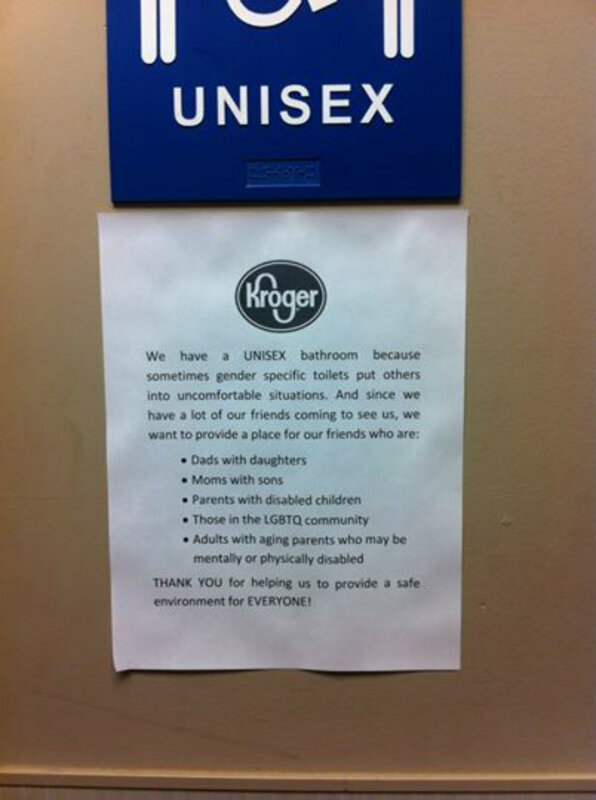 A Kroger grocery store in Georgia has a bathroom without the traditional specific gender label, and to avoid any confusion about the implementation they decided to put along with the sign a simple piece of paper informing customers why the restroom is available. “Since we have a lot of our friends coming to see us, we want to provide a place for our friends who are dads with daughters, moms with sons, parents with disabled children, those in the LGBTQ community, adults with aging parents who may be mentally or physically disabled,” it says. “Thank you for helping us to provide a safe environment for everyone!”, as reported by TIME. Tonya Owens, who took the picture, was shopping at the store on Saturday when she noticed the decision made by the grocery store and decided to share shared a photo of the sign on her Facebook account. The post has been shared more than 50,000 times and it has received at least 19,000 likes, so far. The post has received some critical commenters, but many other have encouraged it. Messages like “because everyone goes shopping” have been shared to support the brave movement from the Georgia-based store.